There are a lot of wild onions in my yard. I have used them on occasion for cooking and found them to be very sharp and garlicky. The green tops are basically chives and we've used those, too. But with canning on my brain, and with a larger crop this year, I began to wonder if... yup, you guessed it... I could find a way to preserve them. I was particularly inspired today by an article in a magazine which highlighted a "forager" who just happened to be foraging in my hometown. 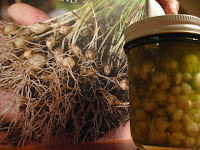 The article mentioned wild onions. Aha! I grabbed one of my new cookbooks and found a Persian recipe for picked onions with mint. I have onions. I have mint. That would be perfect! Harvesting the wild onions was dirty and backbreaking. I enlisted the help of my 7 year old, only to have to play the land version of "Marco Polo" in return. Then I asked for "20 mint leaves," which were dutifully supplied. After the kids went to bed, I started to try to clean all these tiny little onions. It took forever! If it hadn't been for my husband's help I might still be cleaning them. This was the part that was truly labor intensive: washing, trimming, peeling and washing (again) all these tiny little onions. My hands smell like onions. My house smells like onions. And after all that work, I got just under 1 cup of onions. These went into a jar and then I mixed 1/2 c. cider vinegar, 3/8 tsp. of kosher salt, 20 mint leaves and a little garlic in the blender and poured it over the top. This is supposed to sit at room temperature for 1 day and then be refrigerated or maybe I will process it then. And then I have to get brave enough to try it! I would like to point out that the cutting board in the photo was in fact my "work station."